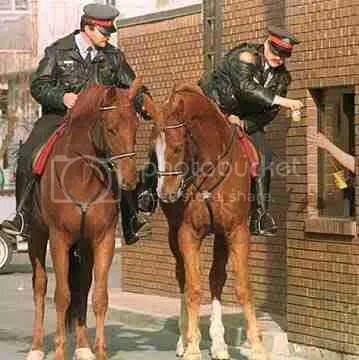 I just love pictures of horses going through the drive-thru. Darling little horse. I raise them myself but have never had one this tiny. I do not raise registered horses because then most little kids parents cannot afford them. I currently have 3 mares, 1 stallion, 1 weanling stallion and one weanling filly. I will have some of these for sale the spring of 2010. I have been around horses all my life and have found great joy in the little horses. Because of my health I am no longer able to ride regular sized horses so I went to raising the little ones. A true miniture horse is the most gentle of creatures. They do not have the mean, nor naughty traights that shetlands have. They are two different breeds and most people do not realise they are different. If you like horses and do not have the faculities for large ones, you will dearly love the mini’s. The stallions I have, you would never know they are stallions unless a mare is in season. Even then, you can handle them without any problems. They are as true to you as your favorite dog. Precious creatures!! !